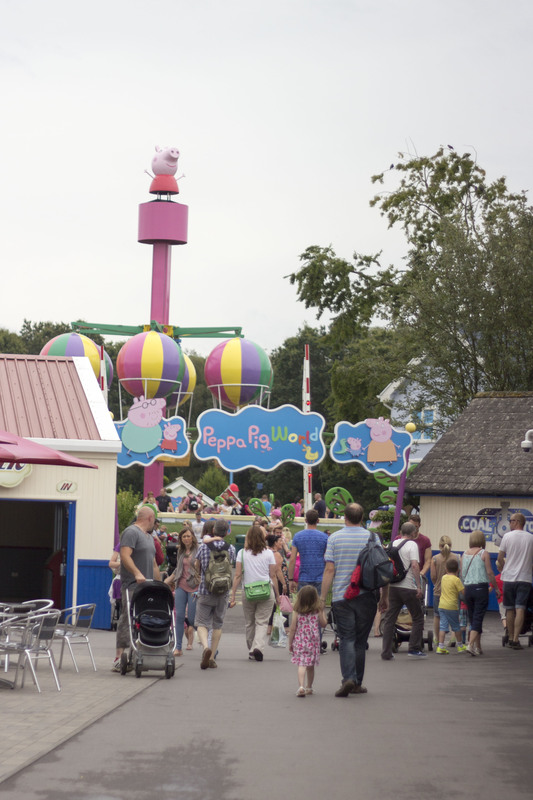 Paulton’s Park is the home of Peppa Pig World. There are rides a plenty, gardens, a few animals, but it seems that the majority of visitors here all make a beeline for the piglet. 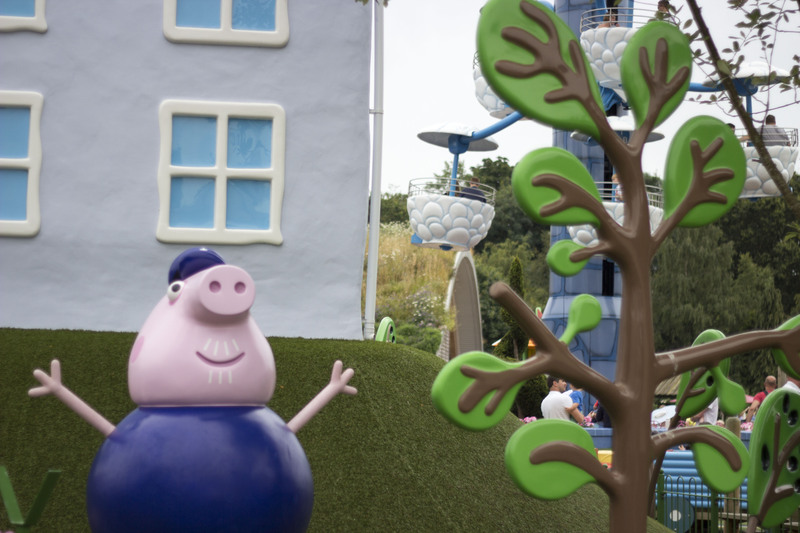 Here you are immersed in Peppa’s world and surrounded by various characters and buildings from the cartoon. Music plays around the park and occasionally you’ll hear Peppa giggle over the speakers (you hear Daddy Pig too, although after five hours of listening his laugh somehow magically turns into Jabba The Hut). The attention to detail to this place is amazing. They’ve even used the narrator from the program to read out the safety announcements for each of the rides. I’m quite surprised to read on the Paulton’s Park website that there are only seven rides in PPW. There seemed to be a lot, lot more. The actual area is fairly compact but full of things to look at and it’s easy to navigate and we let Betsy decide what she wanted to do on the day – she wanted to try everything! Considering we were there on the first Saturday of the summer holidays, it didn’t seem too busy and queues for all the rides were bearable, I don’t think we had to wait for more than 10 minutes for anything, which is good when you have a very excitable toddler with you. There’s also a decent sized playground that Betsy spent a huge amount of time in and she would have been in George Pig’s soft play for an incredibly long time, but as we didn’t bring any socks with us, Boo was forbidden to explore – the staff are very hot on who’s wearing socks and who isn’t. It looked amazing though, I doubt we would have seen Betsy again had she gone in. We really loved George’s Dinosaur ride. It was the longest wait for a ride, but it lasts for a while and as you move round you find yourself alone and having a bit of peace and quiet. 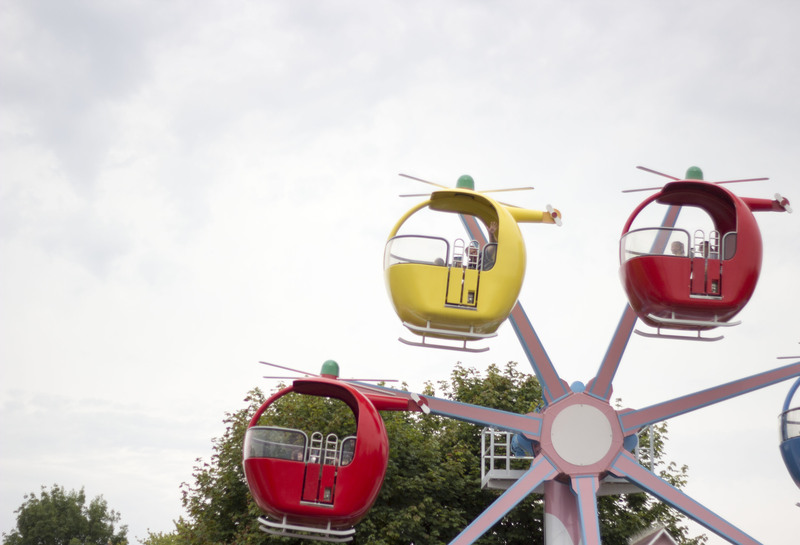 Betsy got a bit obsessed with the helicopter ride – she was tired but still wanted to go on rides and got very focused on wanting to ride on a red helicopter. Getting a particular colour of helicopter on this ride is all down to the luck of the draw and the two times she went on this ride, she went in blue and yellow ones but not the red. She got a bit upset about that, two months later and she’s still asking to ride the red ‘copter! Next year, Boo, next year. Around PPW’s perimeter are a few of Paulton Park’s older rides including this big water slide. If you look closely in that picture you see that Betsy is in the boat second from the left. That slide was one of her highlights of the day. That girl has no fear. As with all places like this, food and drink are expensive. We brought a packed lunch, but the food we saw looked good. They also sell local New Forest ice cream rather than the big companies which is a great touch and bloody delicious too (I could be biased what with growing up with the stuff though). All the staff we met were lovely and cheerful, in particular the chap who cleaned up Betsy’s knee after she scraped a scab off falling over. 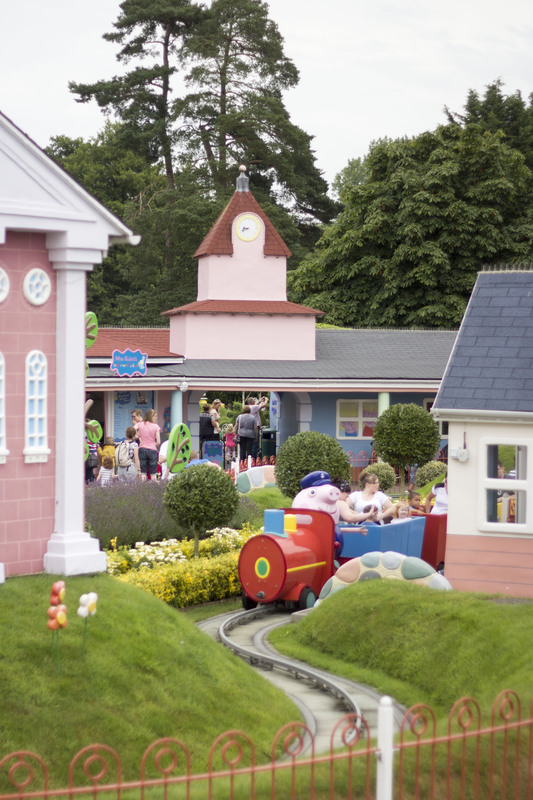 There is so much to see here and we will be back next year, hopefully to explore more of Paulton’s Park itself, especially as there are plenty more rides for small children to have a go on. You could easily do two days and not try everything. I want a go on the gorgeous Victorian carousel and I think Betsy might try and get on a red helicopter again. Helpful write up! We are excited about our trip tomorrow, hope it’s as good as yours.